Getting started on your new website with Swiiit is simple. Check out our videos and user guides to see how easy it is! Contact us at 6848-8900 or support@commontown.com for technical help. Find out just how easy it is to build a website with the Swiiit web builder by watching this video! 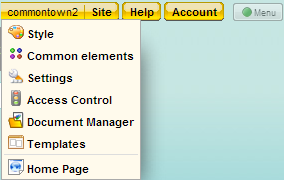 You can insert these applications easily using drag-&-drop! Use them on your Swiiit website today. We provide Swiiit trainings free-of-charge to our school customers! To find out more about these sessions, click here.